Owner-operator of The Belfry, a mask, puppet and costume studio/storefront store, 1991-present; studied fine art (drawing, sculpting, painting and jewelry-making) in college. Worked in Ashland, Oregon at the Oregon Shakespeare Festival in costume props, making masks, armor, crowns, jewelry and leatherwork, 1981-1987 full-time, plus freelance contract projects through 1998; worked at Will Vinton Studios in Portland, Oregon, building sets, puppets, masks and props, and doing animation, 1987-1990 full-time, then freelanced on projects until 1998; worked at Imago Theatre and Tears of Toy Puppet Theatre in Portland, Oregon, mask-making and performing; worked at Jim Blashfield Studios, Chel White Films, and in Gus Van Sant films in Portland, Oregon on a contract basis, building specialty puppets and props, periodically from 1991. Have done numerous freelance jobs building puppets, masks, costumes and props for ballet, opera and theatre companies while running The Belfry. 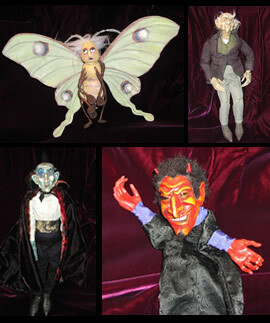 Opened a puppet theatre, Runaway Circus Puppet Theatre, in 2005; built and performed puppet shows. Participated in the mask market in New Orleans for the past 14 years. Description: Just in time for Halloween! Each student will bring a design for the mask they want to create! We will be using a blank face mold as a base. From there we will sculpt the mask using potters clay, then make a mold using plaster of Paris. The potter’s clay will be removed, and neoprine will be poured in the mold. Students will need to paint their masks on their own but I will advise on what paints to use and other finishing methods.